I am so thrilled to now be working as a Creative Consultant to the Sonoma County Winegrowers! It is exciting for me to be involved with so many iconic wine growing families in the county who have for generations passed on their farming traditions. This new consultancy also puts me in the middle of conversations about shifts in wine growing practices which I have observed evolving through the years. Sustainability is the most recent term that has been appearing consistently in the consumer marketplace. The Sonoma County Winegrowers (SCW), announced back in January of 2014 that they were committed to becoming the nation’s first 100% sustainable wine region. This was a big undertaking considering the number of winegrowers in Sonoma county! Let’s examine briefly the difference between the practices of sustainability versus organic and biodynamic farming. Sustainability practices act as an ‘umbrella concept’ that can include both organic and biodynamic principles but are not required to be either. A sustainable vineyard encompasses energy efficiency, environmental protection and enhanced relations with employees and the community. Organic farming focuses on more restrictive uses of synthetic pesticides, fertilizers, and fungicides throughout the growing process. Biodynamic farming takes organics a step further by focusing on farming in accordance with the earth’s seasons and rhythms. At the core of sustainable farming there are three ‘pillars’ that really spell out the mission statement…’Planet, Profit & People’. Planet addresses all of the environmental issues to ensure sound practices and good stewardship of the land. Profit examines the practice of being economically feasible. People is the one that really sets sustainable practices apart by putting farmers focus on the needs and well being of their employees and the community at large. Undertaking sustainable farming practices means a commitment by farmers to analyze their business with a finer lens and to constantly be monitoring a path for improvement. It is a newer ‘mind set’ that will help ensure good stewardship of the land and environment and help the community to embrace the ideals of this practice. Sonoma County has an unparalleled wine history and heritage of farm families who are striving to preserve their land for future generations. Striving for sustainability is the kind of good practice that trickles down from the vineyard to the winery, from the bottle to the consumer! My prior post touched upon how no two days in the life of a vineyard are the same and how one really has no control of Mother Nature. Now this harvest season has finally ended for us and I must say that it was quite the roller coaster ride! We were heading into the season with expectations of a smoother and more bountiful harvest than last year. The tonnage looked to be up and the fruit was tasting very good. I was discussing the status on a regular basis with the vineyard manager and at last the day was set to begin. As luck would have it, the day scheduled was my birthday, September 20th…what a nice gift! So on that day, before the break of dawn, we could hear the tractors starting up, trailers being hitched and the muffled sound of vineyard workers’ chatter. Up and at’em with a sip of coffee and cameras ready, we stepped outside and shuffled between the rows getting some really great shots! This is truly an exciting experience to watch the hustle and precision of the vineyard workers fast paced hand picking, first into small bins and then into the large two ton bin on the back of the tractor trailer. As the day progressed I was informed that only half the vineyard would be harvested and that there were two blocks that just needed a little more time to mature…well, you can’t rush Mother Nature. It looked to me like somewhere between 22 and 24 tons had been harvested…now for the wait. We were informed that harvesting would resume on the 27th and probably finish on that day. Well, that was perfect as we had plans pick up a new puppy on the morning of the 25th which would give us a little time to ease her in to the family! We drove nearly 2 1/2 hours to get the new pup (near Sacramento) and on the way back coming out of Napa via the windy 128, Kirsten noticed a very large plume of smoke rising out of the hills ahead…”That looks like it’s very close to us on Pine Mountain!”. Talk about an agonizing ride home…the dog had already lost her lunch all over the back seat and we were in panic mode! Driving through Geyserville on the 101 it was so smokey that you could hardly see the road ahead, but shortly thereafter it cleared up. The reports were telling us that the fire was blazing 10 miles due east from our hillside and that the winds were blowing in the opposite direction, at leas for the moment. As we approached Pine Mountain Road, some people at the bottom were telling us that they were told to evacuate….this was not the perfect scenario introduction for our new puppy and our established 10 year old dog Charlie! Needless to say, when we got home our anxiety level was read by the dogs and they reacted to each other accordingly. We did prepare to evacuate, which created a very eerie atmosphere for all of us, but it never happened. The Sawmill fire, as it was named, consumed more than 1500 acres and took 500 firefighters to finally get control. As the winds were flowing east, we saw very little ash and practically no smoke, which would not have been good for the grapes! As it turned out, our road remained open and harvest was able to finish. As of this writing, our new pup Kadie and Charlie are getting along great (except around feeding time!) harvest tonnage and quality were up, and as a bonus we are pressing 100lbs of Cabernet grapes to make a little wine for our house with the help of our good neighbors, and we picked an additional 20lbs of grapes to make jelly! I have to say there was not a dull moment in this harvest season…can hardly wait for the next!!! Every growing season has its ups and downs. Each season leaves its mark and no two are ever the same. Every single day in the vineyard adds to the DNA that will help define the characteristics of the wine in the bottle. It is never a perfect process…as a matter of fact it is perfectly imperfect! I’ll give you some examples; three years ago our harvest took place in the middle of a freezing cold rain storm and took two days to complete, last year was a big challenge as the four year long drought was finally taking its toll, the addition of wild fires and last minute rain storms made for a challenging growing season. All of these events have an impact on the end result . We were luckier than most last season, going down from 76 tons two years ago to just 38, but some grape yields were down as much as 60 percent or more due to the drought. Now with harvest just two weeks away, more or less, everything is looking very good and the fruit production will definitely be up from last year, guesstimate at +-50 tons. The anticipation is somewhat agonizing…what could happen next? You can feel the excitement and anxiety in the conversations I have been having with growers and winemakers alike. This past week, we awakened to heavy fog on the mountain with cool temperatures hanging around till noon time, thus slowing down the maturation process…last year, no fog at all. As I am writing this, it is very humid as clouds are blocking the sunlight…could there possibly be a shower coming on? That would not be a well timed thing right now! Although technology in wine making and grape growing has come a long way, there are certain things you have no control over. Ill timed rain, too much sun/heat, the wrong bugs, wild fires, wind, hail storms, wild boar, wild turkeys, wild deer, make for a very wild ride! This is the time of year when you hold your breath a little with the hope that there will be no new surprises! So, if you are a ‘control freak’, this is not a business you would like! Every time I see a drone it makes me think of the sinister U-2 single jet engine spy plane era during the cold war, those sleek long winged planes with cameras mounted on the under belly so as to take photos over restricted areas. We’ve come a long way since then, and nowadays unmanned drones are doing everything from war zone surveillance to front door package delivery. It can be a little unnerving! While many times they can be seen as an annoyance, there are in fact some favorable applications for drones; from aiding authorities to assess damage after a major fire or earthquake, to helping farmers, winemakers and vineyard managers better maintain their crops. Drones can be easily controlled from the ground and equipped with visual and multi-spectral sensors to monitor pretty much anything they fly over. Sometimes it’s just hard to get the big picture from the ground. In a vineyard, the color of vines and signs of stress patterns are easier to see from above and aerial surveying with drones, especially on steep slopes is tremendously helpful! 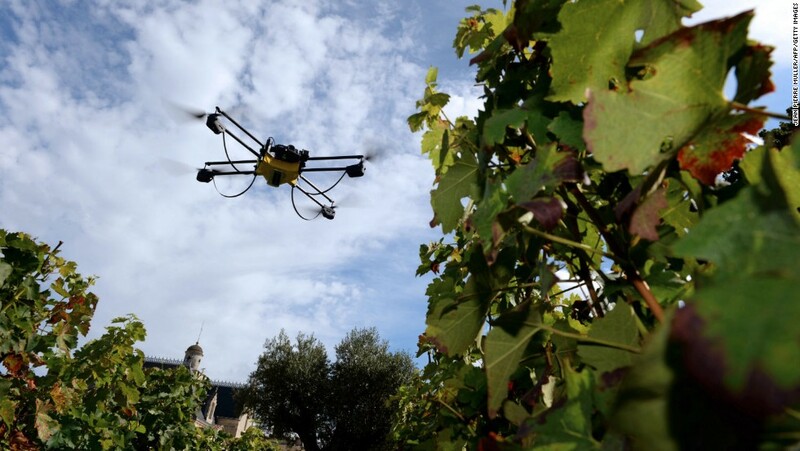 Can the use of drones actually help to make better wine? First of all, seeing a crop from the air can bring to light everything from irrigation problems to soil variations and even pest and fungal infestations. Second, the drones cameras can collect multi-spectral images providing data from infra-red as well as the visual spectrum which can be joined to create a view of the vineyard that highlights differences between healthy and distressed vines in a way that can’t be seen with the naked eye. Additionally, drones can help to determine a vineyard’s overall density from sensors installed on the ground. These sensors measure temperature and humidity, and communicate or “talk” through a transceiver. Based on that data, soil moisture monitors can measure water volume at different soil depths. Using specialized software, vineyard managers can then synthesize the crop data and make decisions on how to adjust their practices to improve the health of their vines. While federal rules dictating drone use apply equally to rural areas as densely inhabited urban ones, some restrictions on flight operations, like always keeping the drone in sight and daytime-only flying, are expected to be relaxed or modified for agricultural and rural use. I think that drones can offer winemakers and vineyard managers a new perspective and be part of effective technology to help make better wine and who wouldn’t be for that! Leave it to one of the best story tellers of our time, Francis Ford Coppola to bring an intriguing new experience to Sonoma County with his Virginia Dare winery. When I first saw the name go up on the winery building I was perplexed, who would want to name their winery “Virginia Dare” in Sonoma County!?! So we paid a visit with some friends on a rainy day to check it out. The whole experience was very inviting and once we go to know more about the legend behind the wines, we were intrigued! Why Virgina Dare you might ask? Apparently there had been a winery with this name in the late 1930’s and their ads included a ‘jingle’ that had an impact. In an interview Francis did with the “Today” show on NBC back in October 2015, he described how the ‘jingle’ stuck with him after he heard it at 5 years old. This ultimately led him to discover the story of Virginia Dare, the first child of English parents born in the New World. It’s amazing to think of the subtle impact of something like this, but then I started to think back to when I was maybe 8 or 9 years old and hearing ‘jingles’ on the radio and how they still stick in my mind to this day…”Hamm’s the beer refreshing”,” Campbell’s soups are mmmm mmmm good!” Even now, the power of a jingle to stay with you is apparent, think about “Nationwide is on your side!” The Virginia Dare song made such an impact on Francis that he turned it into a marketable venture. As a filmmaker through the years, Coppola has had the ability to really engage an audience and bring them into his movies. We all felt as though we ‘belonged’ to Corleone family in the Godfather series, we were with the troops in Vietnam for “Apocalpyse Now” and we experienced jazz in Harlem from the front row in “The Cotton Club.” Now he has take this story telling skill to bring us the legends surrounding ‘Virginia Dare,’ and instead of a film, he and his winemaker Corey Beck have chosen to create four wines, each representing a unique aspect of the story. ‘The White Doe’, ‘Manteo’, ‘Two Arrowheads’ and ‘The Lost Colony’ tell four tales of Virginia Dare through the choice of varietals used and in their presentation. If I were to try and tie this all up together I would say it is about a passion… a passion for telling stories, a passion for film or wine and how that can be translated into something that consumers would want to experience. In this age of instant everything, it is refreshing to find a new story and to explore a new passion, I urge you to expand your own horizons and have fun exploring new wines! There are also two Showcase wines from this winery that are very well crafted and from the Russian River Valley…Virginia Dare 2014 Pinot Noir and the Virginia Dare 2014 Chardonnay…both worth checking out.